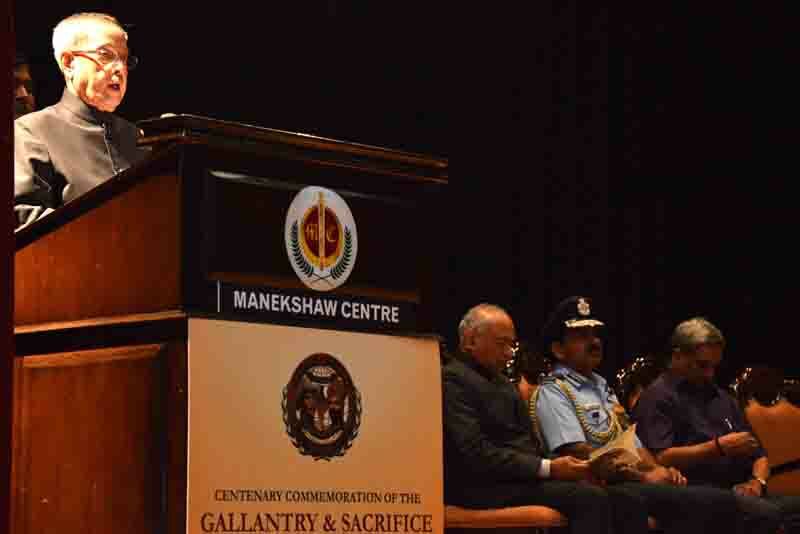 1.It gives me immense pleasure to be here this evening at the Manekshaw Centre for inaugurating the Commemorative Exhibition on the theme, "India and World War – I”. At the outset, let me compliment the Indian Armed Forces for organizing this exhibition to walk down the memory lane to recognize and celebrate the bravery of the Indian soldiers who laid down their lives during the First War. 2.The centenary of the First World War is an important landmark in world history. This occasion reminds the world community of the immense loss of life and material that the world had to endure in pursuit of global peace and stability. In this effort the Indian soldiers played an important role in the various theatres of the War. The Indian contribution of a volunteer army to the war effort was large in comparison to many other contributing nations. 3.During the War, Indian soldiers were in active service on virtually every war front. They carved a niche for themselves by their outstanding loyalty, courage and selfless service and played a significant role in influencing the outcome of the War. The Allied Forces were also in a position to sign an armistice because of the support of the Indian soldiers. 4.A hundred years ago, the world was different. Even though our country was under colonial rule, Indian soldiers etched their name in world history through their bravery and valour. The gallantry of the Sikhs and Gurkhas in the battlefields of Gallipoli is well-known. So is the bravery of the Garhwali, Dogra, Punjabi and Maratha Soldiers, who fought in the battlefields of Flanders and Somme. These soldiers not only won the pickets and trenches but also the hearts of the local population. The humble upbringing of these soldiers in their villages, the teachings of the Ramayana and Mahabharata, infused in the Indian soldier’s conscience a strong set of values – the value of being ‘just’ in their dealings with those whom they have vanquished and of ‘resolutestance’ against the adversary when under siege. These values made them a formidable fighting force. 5.There are numerous battles of this War which highlight the perseverance of the Indian soldiers where along with the British battalions they stoically withstood the fierce attacks of their adversaries. It was for the fine soldierly attributes that by the end of the Great War, the Indian soldiers were decorated with 11 Victoria Crosses, 5 Military Crosses and numerous other awards. 6.To my mind, these men made their sacrifices with a sense of pride and righteousness. This needs to be recognized and celebrated. Today, we pay our respects and honour these men. 7.A hundred years ago, the youth of many a nation was wasted on account of human greed and misguided notions. Today, conflicts arising out of pernicious designs of some terror outfits are claiming thousands of valuable lives in many parts of the world. The rise of non-state actors and lethal terrorist entities is a threat to our nation. 8.The Armed Forces of our nation are capable of meeting all challenges and threats to our national integrity and contribute to world peace and security. We have developed an effective deterrence and stand ready to defend our territorial integrity. The professionalism which our armed forces display today is a continuation of what was so bravely exhibited by the Indian soldiers in the First World War. 9.It is to acknowledge the role played by the Indian soldiers during this historic War, that this Commemorative Event has been organized. It will remind us all once again about the sacrifices made by our valiant soldiers and the role they played for peace and security in the world. I once again compliment the Indian Armed Forces for organizing this memorable event. I wish all of you the very best for the future.